The core of this professional psychotherapeutic training program is the formation of a learning community of students and supervisors. The administration staff and members of the Brighton Park professional and residential community also serve as an ongoing resource for additional learning. The community setting will broaden students experience in the practice of collaboration with psychiatrists for medication, self-help groups, addictions’ programs, or pastors for spiritually based questions and issues. From time to time, seminars will take place, offering students opportunities to meet with experienced clinicians currently working in the field. The Practicum’s supervisory staff is dedicated to the professional development of its students. By offering direct services that enable students to practice the necessary psychotherapeutic skills, as well as indirect professional skills, such as marketing and communications, The Practicum offers comprehensive professional development. Individual Psychotherapy: Practicum students will offer at least 8 – 10 or more hours of individual psychotherapy weekly developing skill in intake, risk assessment, case conceptualization and report writing. 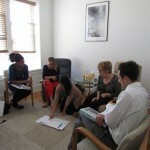 Couples, Group and Family Psychotherapy: The Circle community offers the possibility of ongoing group therapy as well as work with families and couples. Psycho-educational Experiences: Students will have the occasion to offer presentations and workshops to the women at the Circle to foster self-esteem, the development of stress reduction, communication skills and personal growth in relationships. The supervision philosophy of this site is to create a safe environment where students can learn and deepen awareness of themselves in the concrete experience of doing psychotherapy. Thursday will be the required practicum day at The Circle, which will include two individual supervision sessions, professional development discussions at lunch, and two segments of group supervision. Students may utilize time outside of the individual and group supervision sessions and lunch to schedule clients. Other than the required supervision day, students will negotiate the days on which they will meet clients according to their own schedule, the needs of the clients, and the availability of office space. Individual supervision: Two hours of individual supervision will be provided by two licensed clinical psychologists with considerable experience in both private practice and community mental health. Individual supervision will also give the student the opportunity to expand their therapeutic skills and deepen their understanding of appropriate interventions. Group supervision: 1.5 hours of group supervision weekly will offer opportunities for students to review intake and case-presentation material, present case conceptualizations, raise questions, refine and explore responses to clients and learn how to support and cooperate with colleagues as developing professionals. Group supervision will also include review of session recordings, role playing, case presentation and discussion of therapeutic issues that present themselves in the concrete experience of the sessions. Students will be encouraged to review their interventions in the light of their preferred theoretical framework and evidenced-based interventions. Students best fitting the needs of this site will be called for an interview. This site follows ACEPT guidelines and procedures. Preference will be given to doctoral level students because of the possible need for occasional assessment, however, Masters’ level students are also encouraged to apply and will be seriously considered. Applications will be accepted by email ONLY. Please send all materials to memooresh@yahoo.com. The Circle is open evening and on weekends by appointment only. Copyright © 2015 The Circle Resource Center .